ImageTech – Large format printers, maintenance, and supplies. ImageTech and Bayinkjet offer a wide selection of laminating papers suitable for large format printer and plotters. These wide format laminating papers come in seamless printable substrates, silicone release papers, plain kraft paper, among others. Call us to learn more about backers and laminating papers for large format printers. We are experts in wide format printing and an authorized dealer Drytac. (510) 238-8905. ImageTech and Bayinkjet specialize in a complete line of calendered cold pressure sensitive laminates for wide format printers. These calendered laminates are ideal for short-term graphic, including signage, billboards, machinery, car and truck fleets. Our offerings of calendered PS laminates include products by Arlon, Drytac, ImageTech, and Kapco. Call us to learn more about calendered cold pressure sensitive laminates for large format printers. We are experts in wide format printing and an authorized dealer for Arlon, Drytac, Kapco and Magic by Dietzgen. (510) 238-8905. One of the most innovative products we carry at ImageTech and Bayinkjet is the Drytac ReTac WipeErase 6.0 mil (150µ) PET blend with a premium white dry erase finish and ReTac ultra removable adhesive. The non-printable film can convert practically any surface into an wipe erase. Call us to learn more about the Drytac ReTac WipeErase for large format printers. We are experts in wide format printing and an authorized dealer Drytac. (510) 238-8905. ImageTech and Bayinkjet sell a wide variety of laminate and adhesive backers for large format printers. These wide format backers and laminating papers come in seamless printable substrates, silicone release papers, plain kraft paper, among others. Call us to learn more about laminate and adhesive backers for large format printers. We are experts in wide format printing and an authorized dealer for Arlon, Drytac, Kapco and Magic by Dietzgen. (510) 238-8905. ImageTech and Bayinkjet offer a wide selection of thermal laminates and laminating films suitable for all variety of laminating projects. These low-melt products come in a wide variety of finish for all applications, including signs, display, fabric, photography, low-scuff, and more. Call us to learn more about hot laminate films for large format printers. We are experts in wide format printing and an authorized dealer Drytac and Kapco. (510) 238-8905. ImageTech is pleased to now be a Vanguard Authorized Dealer! Fast! 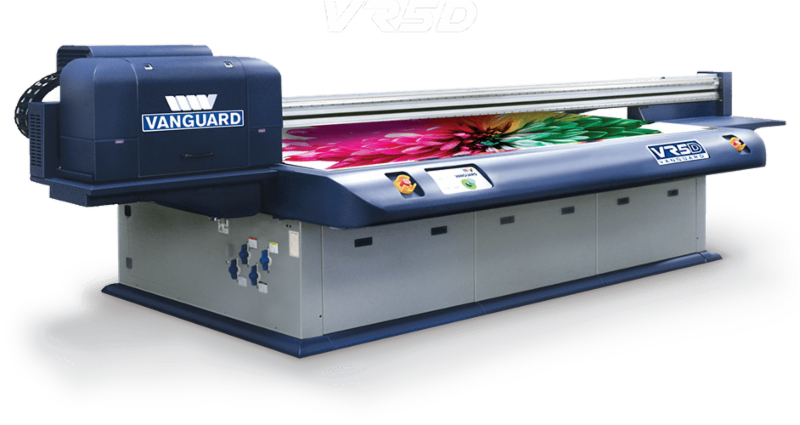 The Vanguard VR5D UV Flatbed Printer combines revolutionary technology, industry leading quality, and outstanding speeds to satisfy the most demanding environment. Precisely adjustable LED curing technology allows you to print to more substrates with greater control. Air assisted pin registration provides precise media alignment. Twin mufflers reduce the noise level of the powerful media vacuum pumps. And most important all a national service team is ready when you need us. Just a phone call puts our group into action and we will get you back up and running whether it’s over the phone or an onsite visit. SGIA PRODUCT OF THE YEAR! Faster! The VK300D is perfect for higher volume shops. With a configurable carriage design, from 2 to 10 printheads, you can start at the production speeds you need and easily add printheads as your demand grows. All without the headaches of having to replace a printer you have outgrown. Adding more printheads saves money & space. With just two printheads you can print 15 boards an hour in production mode. Add two more and reach 25 boards an hour. Eight heads will produce 40 boards per hour at a quality that will satisfy the most demanding customer. 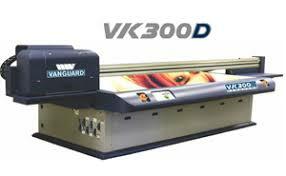 The VK300D is the fast and reliable true 5′ x 10′ UV Flatbed Printer.